Get the Upper Hand! with Milwaukee's BodyGrip® Routers featuring the industry's first tactile handgrip designed into the base of the router, a fast, accurate linear depth adjustment system, a patented above-the-table depth adjustment mechanism, and a carrying case with integral RouterStation. Featuring a 1-3/4 max HP (11 Amp, 24,000 RPM) Milwaukee motor, these powerful and precise new routers give you the upper hand in all but the heaviest of cuts. The BodyGrip® design is a comfortable over-molded rubber grip wrapped around the base with an adjustable handstrap that allows for left and right-handed operation, and two over-molded palm-grip side handles for superior comfort, maneuverability and control. The exclusive linear depth adjustment features a large steel motor lock lever and depth adjustment gearing via a durable threaded screw integral to the motor itself. Both coarse and microfine adjustments are fast and accurate. The router sub-base includes a special access hole for a common 3/8 in. hex extension wrench for above-the-table depth adjustments, ideal for router table applications and eliminating the nuisance of reaching beneath table to set the cutter (or bit) height. This revolutionary system simplifies this once tedious process required with other designs and ensures that the switch and cord remain in the same optimal location. The kit version (5615-21) features an impact resistant carrying case with heavy-duty metal hinges, comfortable free-swinging handle, and on-board wrench and collet storage. Also included is an integral RouterStation, a removable base that fastens quickly and securely to any work surface, providing convenient and reliable storage for the router and accessories. This patented design eliminates the need to change the depth setting or remove the bit altogether before storing the router. For the router user who prefers a trigger control we've created a D-handle version (5619-20). This unit features a durable glass-filled nylon handle with comfortable cushion-grip and a trigger switch with special lock-on button for continuous effortless operation. Take your pick or take them all. 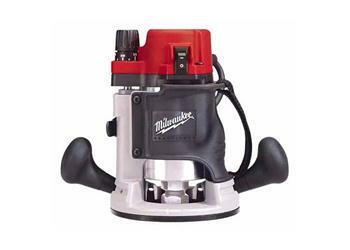 Get the upper hand on comfort and control today with Milwaukee's BodyGrip® routers.